Hersey, John. 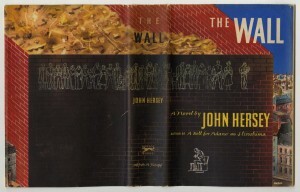 The Wall (jacket design by George Salter). 1950. This collection of about 300 books, book covers, and individual graphic designs shows the scope and development of the eclectic design talent of George Salter. George Salter is recognized as one of the most creative forces in modern book design. His innovative work, done for publishers during the Weimar Republic, produced signature pieces for some of the important literary works of the 20th century. So great was Salter’s international reputation that when he immigrated to New York in 1934, he was immediately able to begin work for American publishers and change the face of American book design. The acquisition and digitization of this collection, which was mainly collected by Prof. Thomas Hansen, Wellesley College, was generously funded by The Cahnman Foundation, New York as described in his interview for the Leo Baeck Institute.